Your college dorm desk is going to be quite bland at first. It's also going to be incredibly uncomfortable to write on as you're taking notes. Well, any hard surface is going to be uncomfortable to write on but when you're in college, it's going to be even worse. That's because you're going to be writing a lot every day. You're going to be taking a lot of notes every day in class and then taking more when you get back to your college dorm room. Yes, your hand and arm is going to be very sore. While you can't make your writing surface in your college classes better, you can make your dorm desk surface better to write on and more comfortable with our cushioned Desert Chevron Desk Mat. Our Desert Chevron Desk Mat is designer styled so you will have unique dorm decoration while adding comfort to your dorm desk. 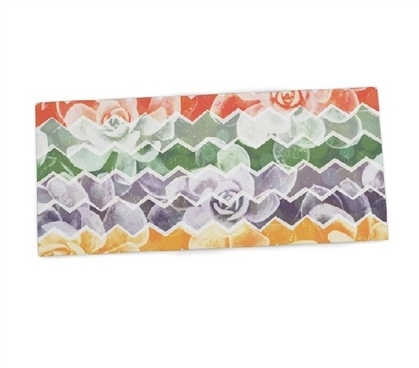 A dorm desk mat is a dorm essentials product that you won't want to go to college without. This dorm necessities product is made of soft, non-skid neoprene that will hold your college supplies steady while you work and help prevent your hand and arm from becoming as tired as they would become without a dorm desk pad. Your dorm desk may start out bland, but you can make it part of your dorm room decor by adding a dorm desk mat that has trendy style. 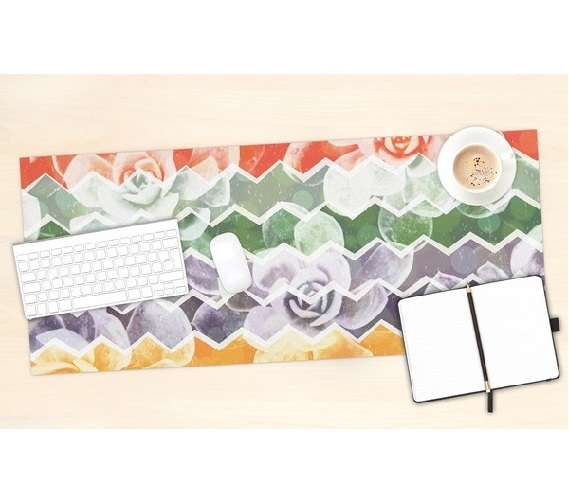 Our Desert Chevron Desk Mat has a frosted rose pattern overlaying rainbow colored thick chevron stripes with thin white chevron stripes breaking up the design. This pattern has a lot going on in it that you can enhance other colors and patterns in your Dorm Bedding or other dorm room decorations. Don't settle for a bland, uncomfortable dorm desk. Make it more comfortable and a pretty part of your dorm room decor with our Desert Chevron Desk Mat.